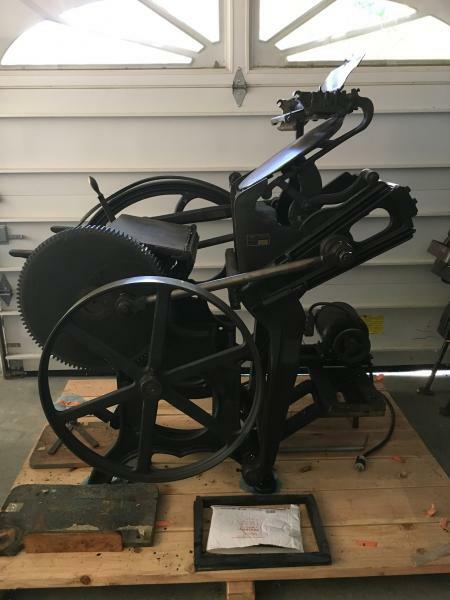 I have a beautiful, antique, 10x15” Chandler & Price style platen letterpress for sale. “Old style”, curved-spoke flywheel. Powered by motor. Press is already secured on a shipping crate, in preparation for transportation. The inside chase (or print) dimensions are approximately 10”x15”. Purchased at auction in 2015 from Brown and Bigelow in Eden Prairie , MN. Mindfully stored in a dry, residential garage. Alternate option: arrange your own crating/packaging and shipping services. Pick-up site is street level, very easy access, residential. No obstacles or complications. If you choose a hired freight shipping service, a truck with a lift-gate will be necessary for pick-up. Please see pictures for condition details and email for any questions.